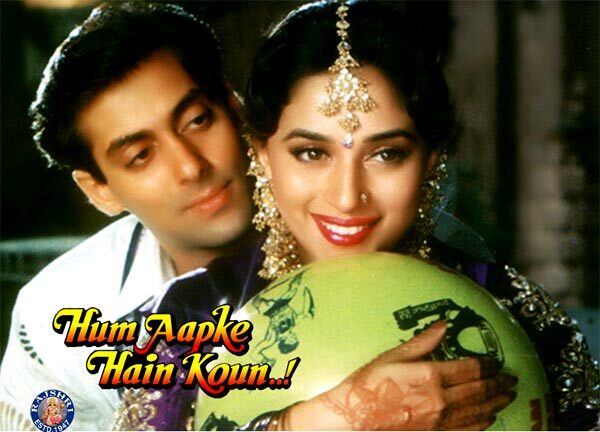 Hello Guys, We are sharing some lovely and romantic dialogues, shayari from movie Hum Apke Hain Koun. Salman Khan & Madhuri Dixit are in main lead role. The movie was released in 1994. This is a romantic comedy movie written and directed by Sooraj R. Barjatya. The movie is based on Indian wedding culture and ralationship between family. The movie shows the how a family love each other and one sacrifice his love for other. It shows the real Indian family tradition. The is the evergreen blockbuster movie. This is the highest grossing film of the 1990 and also highest earning movie forever. The most famous line of the movie is Hum Apke Hain Koun ? The movie has so many romantic lines and dialogues which delivered by Salman Khan and others. The movie is very famous and popular. We can say, this is the evergreen movie. The movie is the best in all ways like story, music, songs, direction and others. Hum Apke Hai Koun won about five Film fare award including Best Film, Best Director, and Best Actress, as well as winning the National Film Award for Best Popular Film. In movie about 14 songs are available, about 11 songs are sung by Bollywood popular singer Lata Mangeshkar. All songs are very popular and famous. This is the must watch movie. "Log kehate hain total mein khubsuarat ladkiyan aksar mar kha jati hain"
"Jab hum ayegen toh...Atisvajiyan hogin"
Kate nahi kat..te nahi lamhe intjaar ke...najren jama ke baithe hain...raste pe yar ke"
"Dil ne kaha..dekhe jalwe husan yar ke, laya hai kaun..inko falak se utar ke"
"Log kahte hai khoobsurat ladkiyan jab jhoot bolti hai......Toh aur bhi khoobsurat lagti hain"
"Aaj pehli baar koi ladki......hamari car ke front seat pe baihti hai"
"Kyun ? hum aapke hain kaun ?" "Roop rang mein gori ho chahe kaali ho ... Khushnaseeb woh jija hai jiski saali ho"
Kehat kavi Rajesh amrit sukh ras ke payali, sali hoti payare aadhi gharvali"
"Jab hum aapse kuch poochna chahe toh aap hum mein rokti hai....Aur jab chup ho jaye toh tokti hai"
"Zindagi ki khasiyat hai yeh kabhi jhukti nahi.....Saanse ruk jati hai magar zindagi rukti nahi"
"Arre kaka main...Toh kaka ban gaya"